While using 'click-and-drag' mode you have to first drag the whole finger and stop on the icon you would want to press, but the "input" will stay there until you do this process again. In the picture above, I dragged the mouse to the "up" movement icon marked in a red circle, after that, if you touch any place on the screen it will bring the mouse pointer there (like it's supposed to do) but if you try to touch once that said place on the screen, it will register the "up" icon and you will walk fowards, rather than the "turn-left" icon, like the image above is trying to ilustrate (touching on "turn-left" icon once, but it registers the "up" icon marked in a red circle). If you want it to stop registering the "up" icon, you have to slide the finger again and stop wherever you would want the next click to happen, as if the mode is stuck in a hybrid between 'trackpad' and 'click-and-drag'. Like I mentioned in the beginning, this does not happen on 'trackpad' mode, you drag the pointer sliding the finger across the screen and then touch wherever you left it and it will register the click like normal. It's also worth to point out that this does not happen with games like 'Lands of Lore' or 'Eye of the Beholder', where their UI also contains movement arrow keys and 'click-and-drag' mode works with them. 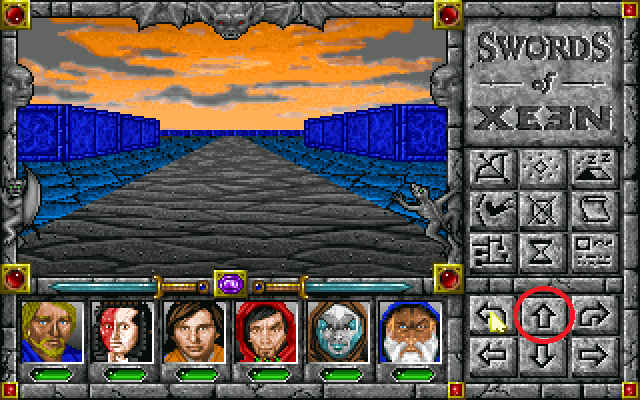 So the issue might be with the engine the Might & Magic games are running in (I tested "Sword of Xeen" and "World of Xeen" which the latter contains Might and Magic 4 and 5 and both have this issue). It would also be nice of someone could test the Android version and see if this occurs there as well, since it could also be an issue isolated to iOS devices. joanthedark: Thanks for the detailed report. This sounds like a bug in either the Xeen Engine or the iOS backend with respect to click and drag. Can I suggest that you file this as a bug (defect) at bugs.scummvm.org. Thanks. However the Might and Magic games are not there yet, since they were added recently and can only be played using the nightly development builds, is it still okay to file a bug report?